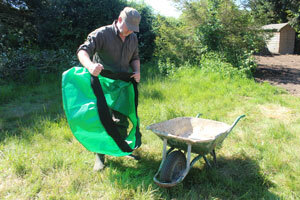 As soon as I started using the Wheelbarrow Booster I was thrilled with how effortlessly it worked. 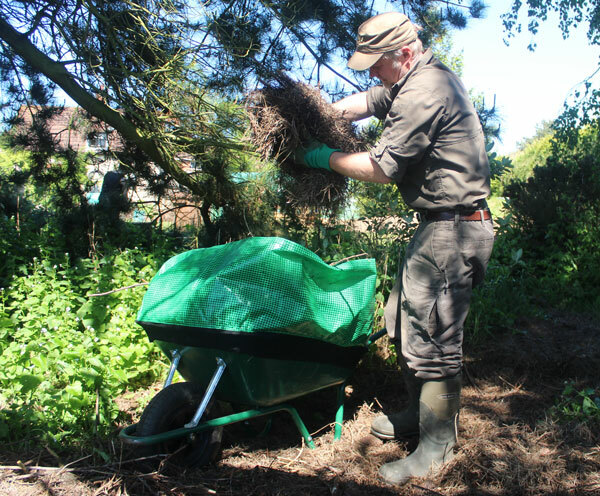 As long as you keep in mind that the Wheelbarrow Booster is designed to help you move ‘lightweight’ garden materials such as grass clippings, leaves and hedge trimmings etc. you’ll find it a great time saving device. 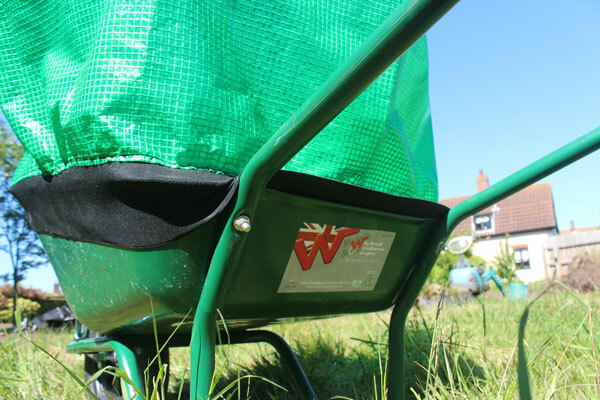 The Wheelbarrow Booster from Greanbase is an elasticated skirt you slip over your wheelbarrow to increase its holding capacity by up to 300%. 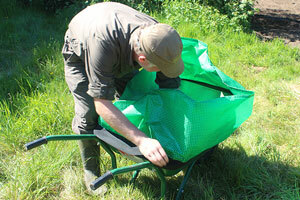 Find out how I got on putting it through its paces. 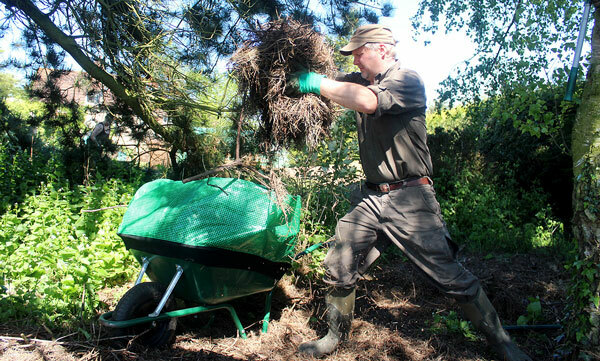 Those of you following me on twitter and facebook may remember that I’m in the middle of some major garden landscaping to help form the base of a new project I’m working on called ‘Project WildPatch‘. 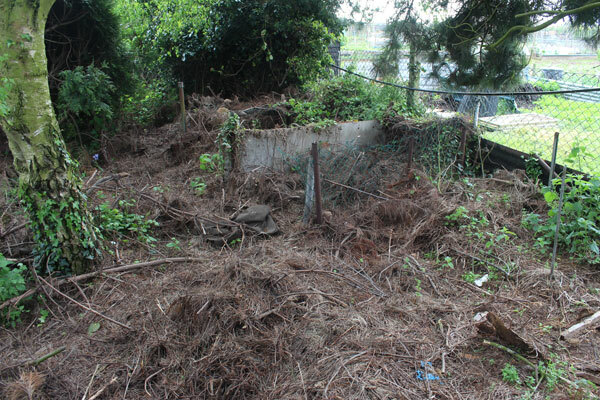 There’s one particularly messy and overgrown area right at the bottom of the garden that I’ve wanted to convert into a ‘Composting Area’ but to be honest I had been putting off the project for a while as I wasn’t looking forward to clearing the huge amount of debris. 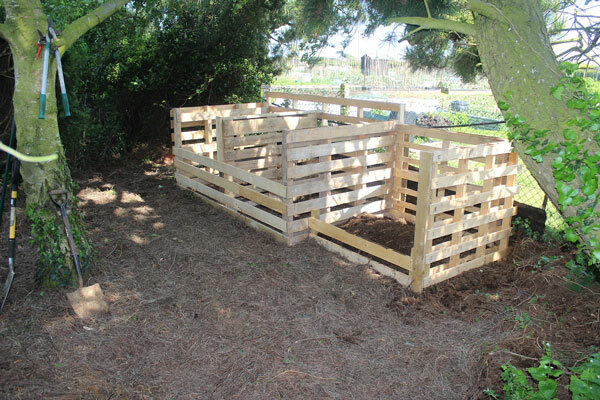 Here’s a ‘BEFORE’ photo of the area. 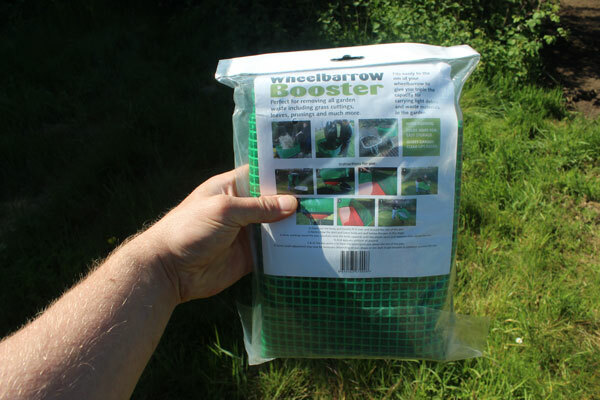 I mentioned this on twitter and was contacted by the guys at Greanbase who said they had just the thing to help with the job! 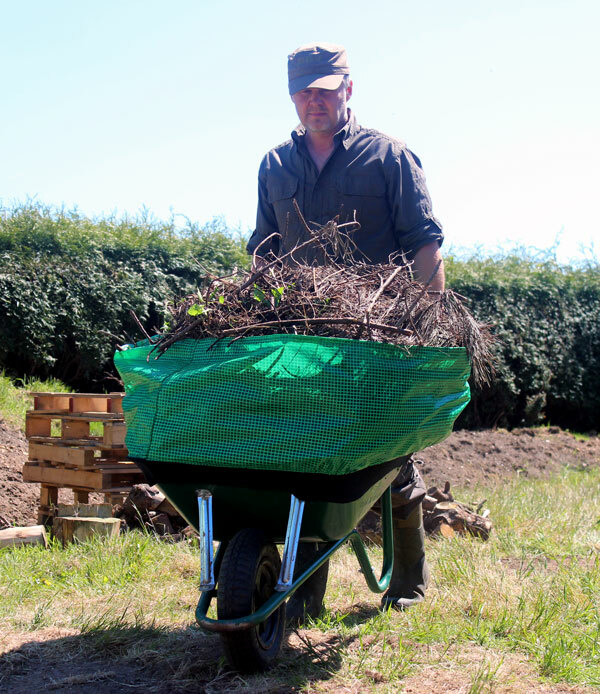 They produce the ‘Wheelbarrow Booster‘ – an elasticated skirt you fit over your wheelbarrow that increases its loading capacity by 300%. This sounded like a great idea! I took a look at their website www.greanbase.co.uk and saw that they had pitched the product on Dragons Den and it had featured on the Alan Titchmarsh show. 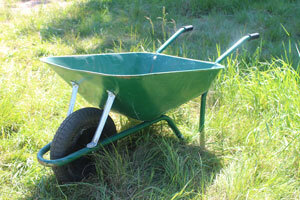 After a brief discussion the Greanbase team kindly sent me a Wheelbarrow booster to try. 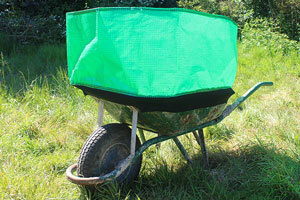 The Wheelbarrow Booster arrived and I was surprised how lightweight and compact it was. After reading the brief instructions supplied I was ready to begin. 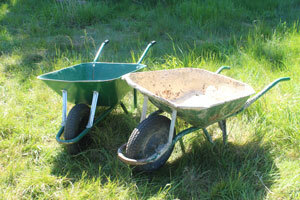 I had two wheelbarrows to try the booster on. Both were slightly different sizes and designs so this would be a good test of the boosters flexibility. Each wheelbarrow had slightly different handle designs so I was interested to see how the wheelbarrow booster would accommodate this. I started by opening the loop of the extender. 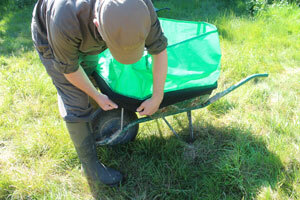 There is no front or back so slipping it over the barrow was straightforward. 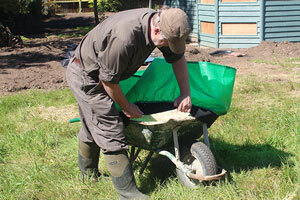 Slipping the booster over the wheelbarrow is easy but you will probably find that it will fall out of position. 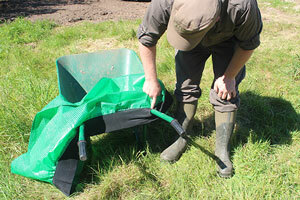 One of the most important things to do is position the elasticated skirt just over the lip edge of your wheelbarrow. This wheelbarrow had a different handle design. 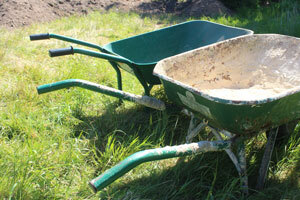 The booster fitted nicely around the front of the wheelbarrow but I struggled trying to fit neatly around the handles. 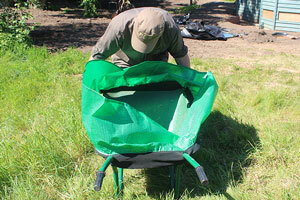 Although I managed to fit the booster to the wheelbarrow it wasn’t particularly secure. 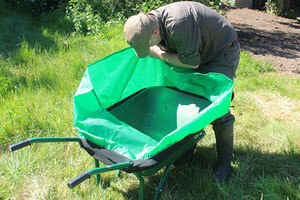 Any movement or slight flexing of the barrow resulted in the booster slipping off. Time for a cuppa and a bit of a think to see if I could come up with a solution. There is a very easy way to eliminate the problem. 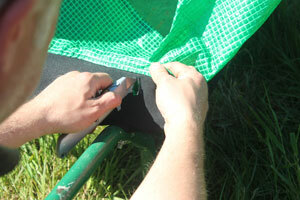 Cut two small slits in the elastic in the approx. position of the handles. Push the first handle through one of the slits. Then push the second handle through the remaining slit. 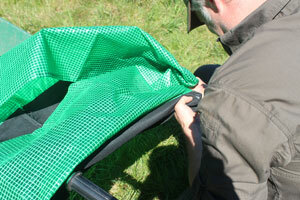 Slide the elastic along the handles right up to the barrow lip. Once the handle mod had been made it was easy to slip over the booster. 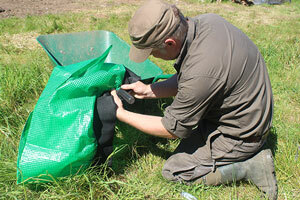 It was then incredibly easy to adjust the booster correctly around the wheelbarrow lip. It must have at least halved the amount of trips I made to and from the skip and after a few hours hard work it was still going strong. 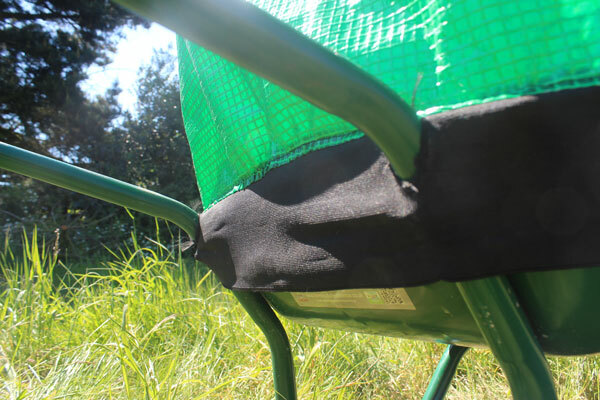 How long the elastic lasts once it gets wet and is used over an extended period time will tell but I would be more than happy to recommend the Wheelbarrow Booster to anyone.